Budapest’s classic charm and architectural treasures make it a top destination for those looking to experience the culture and history of Europe. It’s also known for hot springs, hearty food, and some seriously good nightlife – which also happens to be some of the most affordable on the continent. Much like the city itself, the best hostels in Budapest are fun, lively and affordable for travellers. Think central locations, party vibes and super stylish dorms. The River Danube divides Budapest in Buda, the West portion, and in Pest, the East portion. The main attractions are located on both sides of the river, but most hostels, bars and restaurants with backpacker prices are located in Pest. In Pest, the districts with more hostel are: Erzsébetváros / District VII (the historic Jewish quarter that has beautiful little streets and the most famous ruin bars and clubs), Terézváros / District VI (quarter with some more modern parts and attractions like the House of Terror and the Opera) and Lipótváros / District V (quarter by the Danube, house of the Parliament, the Shoes on the Danube Memorial and Liberty Square). If you choose to stay in any of these districts you’ll be able to walk to all main attractions, including those in Buda. So if you’re planning a trip and need somewhere awesome and affordable to stay, then keep reading for 15 of the best hostels in Budapest. Looking for the best hostels in Budapest to make your budget go further? Hostel Basilica One has the solution for you, offering a free home cooked dinner every single night! Yup, eat at the hostel and avoid spending all your money on eating out – which leaves more money for more important things like beer, and… more beer! The hostel itself is spacious, modern and stylish – made by travellers, for travellers and perfect for revellers! At night, the friendly hostel staff turn into professional party people, expect drinking games and insider tips on the best nightclubs. If you like to move-it, move-it until the wee hours of the morning, you’ll be right at home at Hostel One Basilica. This is the type of hostel you’ll feel at home in, the minute you walk in. Big Fish Budapest Hostel combines great staff and atmosphere, with beautiful dorms and commons rooms. 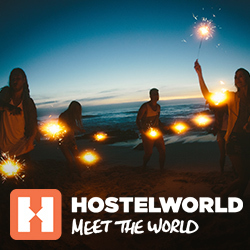 This customer sums it up: “What can I say… Just the perfect hostel, in the perfect city. The staff are awesome, the atmosphere is so cosy and welcoming. If you are a solo traveller and you are looking for knowing people, big fish is definitely for you”. Designed for backpackers and solo travellers, Central Backpack King, is the ideal place to meet new people and to use as a base to explore the city. With a buzzing social atmosphere, this hostel places an emphasis on experiences and the golden age of backpacking (aka, before the Instagram tourists took over!) Offering way more than just a bed to crash in, Central Backpack King organises daily pub crawls and various shenanigans throughout the week to encourage guests to explore the city together. Located inside a gorgeous historic building, Maverick Hostel is popular among travellers for its central location and proximity to iconic Budapest attractions. A stunning sight in itself, the hostel is housed in a beautiful, grand building and the inside is equally impressive! Staying in Maverick feels like staying in your own apartment with a kitchen on each floor. There are so many reasons this is one of the best hostels in Budapest, like free Hungarian wine and pálinka tasting nights, as well as regular social events scheduled to help you experience the local culture and meet other travellers. With the same high standards, Maverick hostel opened a branch in the Jewish Quarter called Maverick City Lodge. Flow Hostel enjoys fresh hippy vibes, with gorgeous, spacious communal areas and a bright, minimalist design. Namaste! The walls in the communal areas are filled with charming plant baskets just begging to be Instagrammed. In the rooms, each bed serves as a living unit complete with personal lockers, reading lights, shelves, and finished with privacy curtains. Flow also offers tours to Széchenyi Thermal Bath, as well as a pub crawl and bike rental for 10 euros. If you’re looking for the best hostels in Budapest, why not just go with the Flow?! Wombats Hostel Budapest is a colourful cove of delights, right in the heart of the buzzy downtown. As well as spacious dorm rooms complete with private bathrooms, Wombats offers stylish private rooms and a whole heap of free treats! There’s a free welcome drink for all guests, free WiFi throughout, free city guidebooks, free luggage storage, free lockers in every room, free food in the guest kitchen AND free towels and linen… We bet you can’t say all that without getting out of breath! Starting to see why this is one of the best hostels in Budapest? If you’re still not convinced, maybe the onsite bar will change your mind. As the guests wake up at very different hours in party hostels, this hostel chain decides to offer in all their hostels around Europe a FREE family style dinner instead of a breakfast. The result? Every single night at Hostel One Budapest starts with a chatty dinner, crazy drinking games and a pub crawl that goes to the main ruin bars and clubs in Budapest. You will feel welcomed, make loads of friends and be near to the main attractions. All about the social vibe and notorious for riotous parties, Grandio Party Hostel says it all in the name… Think grand, think party, think hostel! With drinks served around the clock and a never-ending party, this hostel is THE place for meeting fellow travellers and letting loose! As well as the electric atmosphere, Grandio Party Hostel boasts an awesome courtyard with a grungy, forest-like flavour and its own bar serving ridiculously cheap drinks. Be warned, this hostel is super lively all the time, self-proclaiming ‘you can sleep when you’re dead so don’t expect to get any sleep here!’. Rock on. Such a high rating with almost 4k reviews shows that Carpe Noctem Original is not joking around. This is a party hostel for the sociable backpacker who enjoys a homely place to stay, yet also wants to explore the crazy Budapest nightlife. This review pretty much sums it up: I had the best time here everyone was so upbeat and ready to party. “Loved the facilities & staff & the people staying there. Really cool to connect with everyone and spend time together, definitely my favourite”. In Vitae Hostel the nights have everyone’s type of fun, choose between: a thermal bath party, a bus party, or a crazy karaoke party with people from all around the world singing out of tune together. This party hostel can still be chill, offering different common rooms for games, movies and of course international mingling. Get your camera ready, as this hostel will give you so many amazing pictures for Instagram, that you’ll have trouble choosing which one to post. The vintage circus inspired decoration mixes with the 19th-century building creating a unique place. But, this hostel is not only pretty, you will also feel welcomed by the staff and meet other travellers in the common area. The Full Moon Hostel made our best hostels in Budapest list for its unbeatable design and its rooms for all types of traveller. Dormitories, triple rooms, double rooms and even VIP double rooms, this place offers the comfort and style of a hotel with the social atmosphere and affordability of a hostel. Oh… and the building is simply wonderful: painted sky blue with white beam details. This is the hostel for those who love to stay really close to the city attractions – in this case, almost inside! The huge Pal’s Hostel is located just a few steps from St. Stephen’s Basilica and puts you in walking distance from all the main Budapest attractions. You’ll also find friendly staff and a large common area to meet other travellers. If you’d rather stay in a smaller hostel, check the other Pal’s hostel in Budapest: Pal’s Mini Hostel in Octagon Square. Avenue Hostel knows how to cater for all types of traveller, whether they’re after luxury or budget! With dorm rooms ranging from 4-12 beds, and available for as little as £6 a night, we’re sure you’ll find somewhere clean and comfortable to lay your head. In the Standard and Deluxe rooms, each bed comes with its own privacy curtain, locker, reading lamp and power point in the uniquely designed sleep pods. You’ll also find a fully equipped main kitchen and communal guest kitchens on almost every floor of the hostel so anyone wishing to cook up a storm! Located on the main boulevard in the heart of the city, Adagio Hostel 2.0 Basilica is an adult playground with explosions of colour and funky decor throughout. Although not necessarily a party hostel, this doesn’t mean you can’t have a lot of fun. It DOES mean that you can expect a comfortable and quiet night’s sleep, leaving you refreshed and well-rested to explore the city the next day. With the choice of dorm rooms or privates, this hostel has the right room for every type of traveller! You’ve seen all the best hostels in Budapest, now tell us in the comments below if you prefer to spend a night in the ruin bars or a day in the Roman baths? The post The 15 Best Hostels In Budapest if You’re Hungary for Ruin Bars and Roman Baths appeared first on Hostelworld Blog.